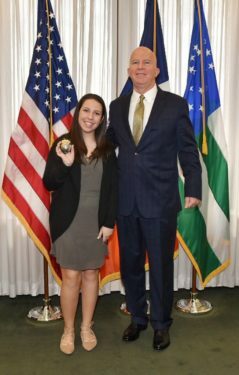 On June 7, I had the wonderful opportunity of personally meeting New York City Police Commissioner James O’Neill and shadowing him for the day. This experience helped me realize that you can achieve any goal with a little hard work and perseverance. Commissioner O’Neill is in charge of 36,000 police officers and 18,000 civilian employees and has the tremendous responsibility of keeping New York City safe. Yet, he still found the time to make a connection with my family and me. You can really tell from the sparkle in his eyes just how much he truly cares about the safety of all New Yorkers and how much he loves his job. It was truly amazing hearing him speak with pride about the decrease in crime around the city and the changes he made in order to better serve the New York City people. My experience helped me appreciate the NYPD on a whole other level because of all the sacrifices they make everyday just to keep us all safe! Fiordimondo took over the commissioner’s desk for a full day. 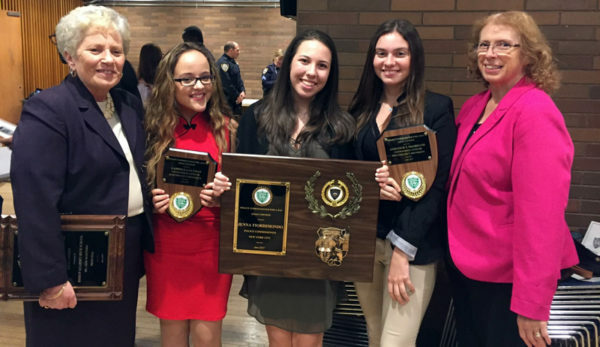 At seven in the morning, a detective picked us up and escorted us to NYPD headquarters at One Police Plaza for the award ceremony. It was truly an honor to meet so many respected police officers and spend the day with them. I was also very happy to see many familiar faces! It meant so much to me that my principal and English teacher also attended the ceremony. Afterwards, I went upstairs to the 14th floor to have lunch with Commissioner O’Neill. 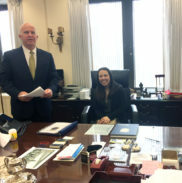 He graciously let me sit at his desk, which belonged to not only the past commissioner, but also to former U.S. President Teddy Roosevelt. He also walked me through his busy schedule for the day and explained that although he works from six in the morning to about ten at night, he wouldn’t trade his “job” for the world. This made me think about my future career and that whatever I choose, I shouldn’t be afraid to work hard. Commissioner O’Neill taught me that if you are passionate about what you do, your career will never feel like “work.” Bishop Kearney High School and the police department showed me that I should always chase my dreams! Commissioner O’Neill was definitely a hard act to follow! I went to bed exhausted that night from a full day of “enforcing the law and maintaining order” in New York City! !